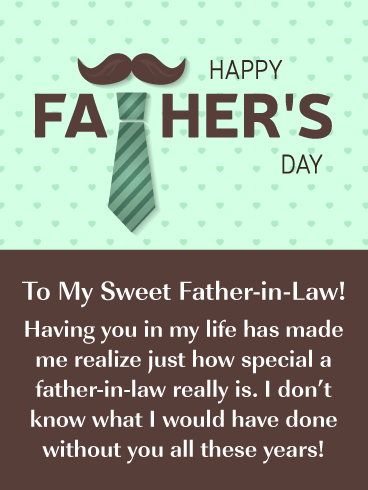 If you have a father-in-law that is very dear to you, then this is the card for him! 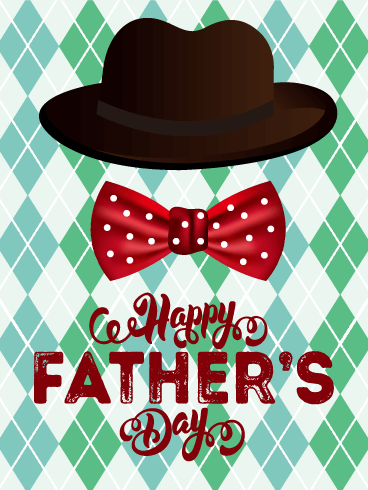 It features a great shade of green and a traditional Father’s Day tie. It’s perfect! The message will warm his heart as he reads that you don’t know what you would have done without him all these years. So be sure to send this thoughtful card his way to make sure he has an extra special day. 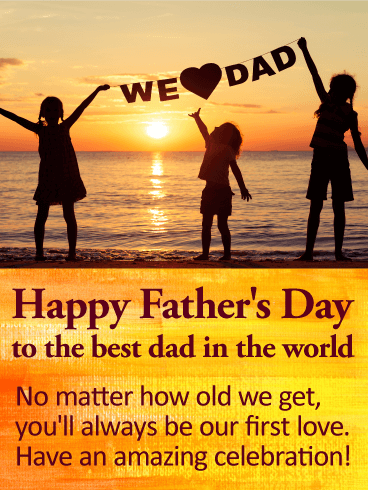 A sweet scene of three young girls proudly holding a "WE heart DAD" banner overhead on the beach at sunset is a wonderful way for daddy's girls of any age to wish the first love in their life a Happy Father's Day! This touching Father's Day card, with its heartfelt message, will let dad know that he's always in your heart, no matter how old, or how far away in miles, you all may be. He's the man you've looked up to from the very beginning, and he's always been a hero in your eyes. 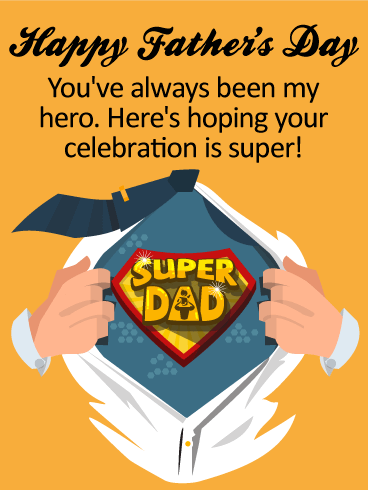 Let your #1 dad know what he means to you this Father's Day by sending him a special Father's Day card to wish him a "super" day! Against a bright yellow background is the image of hands, giving way to reveal a "Super Dad" shirt under a suit and tie. It's a reminder to him that among the many roles he plays, his role as your father has been the most important one to you, and always will be! Strength. Love. Determination. All of these are qualities you admire in your dad. So on Father's Day, remind him of the hero he is with this sentimental Father's Day card. The image of a child in a cape sitting on his dad's strong shoulders while they look into the sunset is a touching and powerful image to get your feeling across. 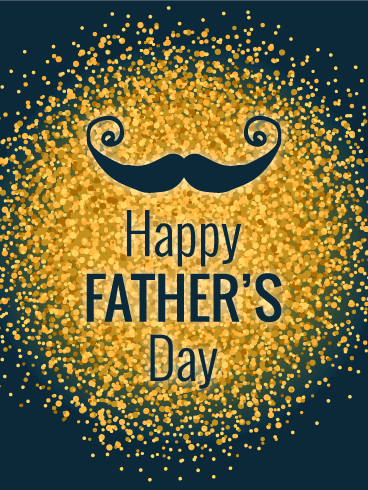 A simple "Happy Father's Day" greeting on top will express so much more to the amazing man you call dad as he celebrates the gift that is fatherhood. 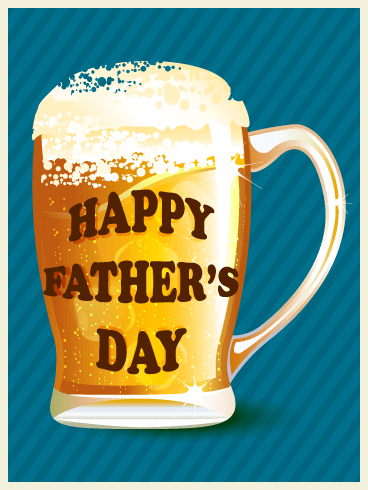 Raise a toast to a special dad on Father's Day by sending him this fun Father's Day card, featuring a mug overflowing with his favorite brew! 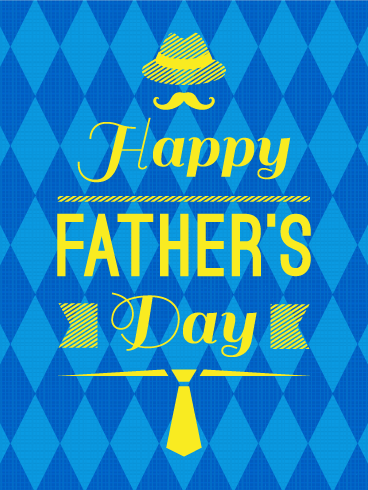 A striped blue background adds a handsome touch, while the message on front is a simple yet sweet wish for him to have a relaxing day celebrating, doing all the things that he loves most. 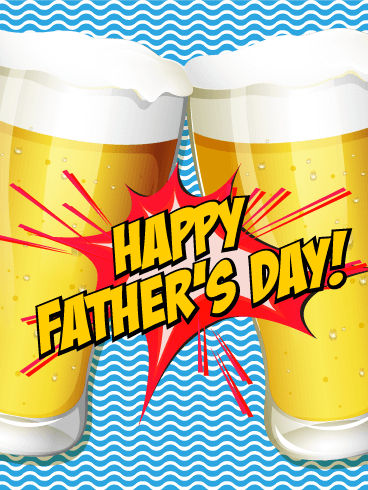 Say cheers to your amazing dad this Father's Day by sending this festive Father's Day card, filled to the brim with your best wishes! A fun, patterned blue background sets the tone for his celebration, while the two beer glasses in front are joined together in a toast. Whether you'll be there to join him on his special day, or letting him know you're thinking of him from miles away, this Father's Day card will definitely make him feel loved and remembered. These two doggies have come to wish your special dad a very Happy Father's Day! Below these two canine cuties is a fun, playful greeting that's sentimental as well. 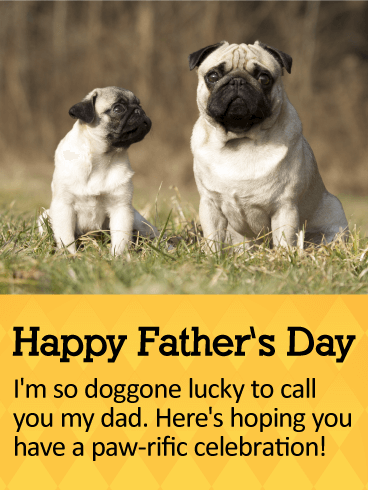 It lets him know how lucky you feel to have him as your father, and that whether you're there with him this year or not, you hope that he has a "paw-rific" celebration...because nobody deserves it more! 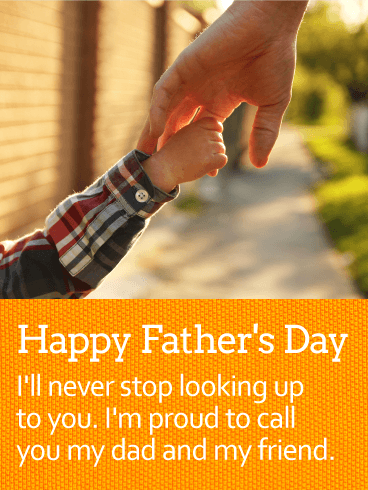 The touching image of a young boy holding onto his father's hand as they walk together makes this Father's Day card a special and heartwarming choice to send to your own dad. It's a reminder to him that no matter how old you get, you'll never stop looking up to the man who has encouraged, supported and loved you from the beginning. Something's broken? Dad will fix it! Something missing? Dad will find it! 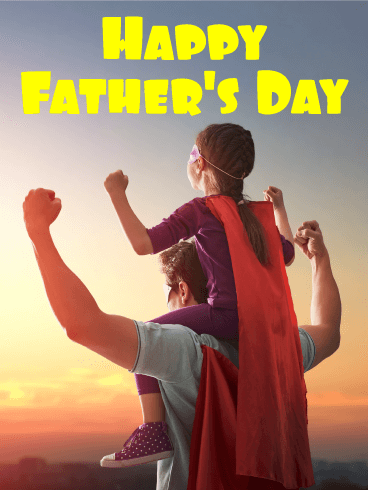 Dad has always been a hero... a superhero... your superhero, in fact. And no matter how old you are, that will never change. 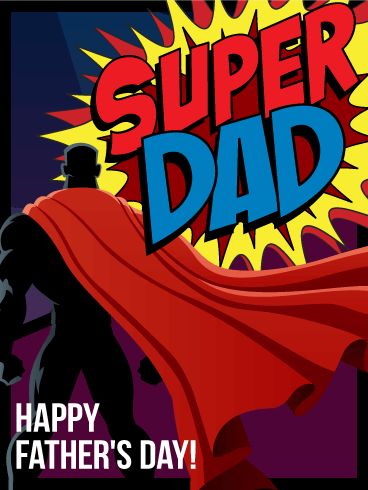 And Father's Day is the perfect time to let him know that, with this graphic-comic-inspired Father's Day card! 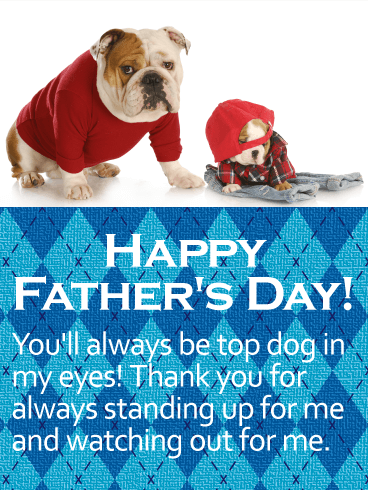 This dapper Father's Day card for dad will have him feeling on top of the world this Father's Day! A golden burst of confetti holds your best wishes, while a sleek black background adds a sophisticated touch. And for a little extra fun, there's even a black handlebar mustache sitting above. Whether it's your own dad, or a special father figure or friend, this whimsical Father's Day card is the best way to let him know that you're thinking of him and hoping he enjoys every minute of his celebration.